It’s never too early to start thinking about your new season wardrobe. While we mourn the impending loss of the late evenings and warm weather, we take comfort by way of planning our autumn looks. Playing with autumn colours, textures and layering is admittedly a nice change of pace from throwing on whatever will keep the sweat at bay. We’ve taken a deep dive into the fashion trends, classics and staples of autumn style to make the transition into the cooler months a little bit easier. So prepare to say Aloha to those Hawaiian sweat-stained shirts, and check out our simple guide on How To Tailor Your Look For Autumn. Matching your wardrobe to seasonal colours may once have been a semi-official rule of fashion but this is no longer the case. Personal tastes, style and your skin’s complexion are far more important factors than sticking to light and warm colours in the spring, and warm and dark colours in the autumn. With that said, it is important to know some basic colour themes to avoid any not-so-flattering contrasts. Seasonal colours are pretty self-explanatory – they take inspiration from the earth and the changes each season brings. In autumn warm and dark earth tones are your friend. A good look might include colours such as brown, amber/caramel/honey, burnt orange, tan, forest green, olive, burgundy, in addition to basic colours like grey, charcoal, and navy. These colours work well together and will make for some nice visual contrast. Ah, autumn, tis’ the season of tweeds, leathers and tartan. You want materials that will not only look good but that will also keep you warm as it gets colder. Light wool/ knit jumpers are ideal for layering before the temperatures really drop. Merino wool is a good choice for value and durability; however for a more luxurious option try cashmere for a touch of elegance. Contrasting these soft materials with a raw denim, jeans or jacket will make the look more rugged. 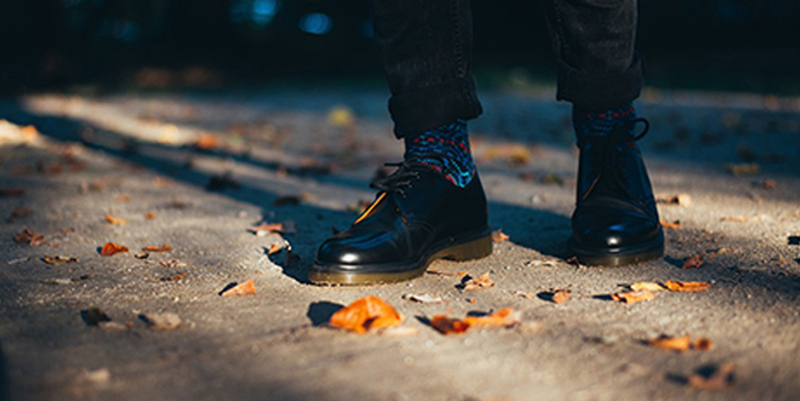 Adding texture to an outfit can be as simple as donning a pair of wool socks or a tweed cap. A good rule of thumb when adding texture to an autumn outfit is to keep pastel colours as the base layer and bury them in richer colours and textures. For example a perfect outfit for a country walk in the crisp autumn air try a tweed jacket, a flannel shirt, corduroy trousers and a pair of Wellington boots. We truly believe a tweed jacket is something that every man should own as it can be styled for any occasion and is just an all round iconic piece. Autumn is a great time to style some classic patterns. A few of our favourites include flannel, tartan and the famous Fair Isle pattern; also know as the “Christmas jumper”. For those of you wondering, it’s perfectly acceptable to wear this fabled print before and after Christmas. Layering is great for several reasons; it’ll keep you warm when you’re outside yet is easily adjustable to account for changes in environment. Wearing layers with contrasting colours, materials, or textures also helps to provide visual interest and flair to an outfit. Layering, when done properly, can also help to conceal your body shape or poorly fitting clothes and create a more flattering silhouette. To summarise, we love layering. The golden rule when layering is to ensure your layers are of different weight/ size as to avoid clashing or looking bulky; while layering can help conceal an imperfect fit, it can't always fix a bad one. Keep in mind what, patterns and textures you are layering compliment each other as not to create a look that clashes. Fashion can be subjective but we can all agree that bright mustard and neon green stripes are anything but complimentary. Chelsea Boots: We love the Barker Bedale for their minimalist appeal; they really come into their own in the cooler months but are versatile enough to be worn all year round. Brogue Boots: These Barker Grace boots combine two of our favourite things, robust style and tweed. They encapsulate everything great about autumn style and they have us longing for the change of season. Derby Boots: Really the perfect dress shoe, and with the Oliver Sweeney Gradella you can guarantee your feet look dapper while being perfectly protected from the elements. This is only a brief overview of how to tailor your look for autumn, but we believe these four concepts are key to nailing your new season wardrobe. Plan ahead, and treat yourself to a new pair of boots this season, check out our extensive range from only the best brands.